Ang Lee's latest endeavor, Billy Lynn's Long Halftime Walk, easily made the top three of my most anticipated films of the year list based solely on the credentials the film was sporting so to finally see some footage and feel reassured in that choice is beyond satisfying. Lee is a master filmmaker and one of the most diverse auteurs in the game at the moment. Over the course of his last three features alone the director has taken us from Woodstock in the summer of 1969 to being stranded in the middle of the Pacific Ocean and now we join him at the halftime show of a Dallas Cowboys game. Based on the novel by Ben Fountain that was published in 2012, the story follows Lynn (newcomer Joe Alwyn) who is part of the Bravo Squad unit that's been fighting in Iraq. After a brief but intense fight anointed as "the Battle of Al-Ansakar Canal", Lynn and seven other surviving members return to the U.S. and are hailed as war heroes. These war heroes are sent on a "Victory Tour" by the government and as part of this tour, Bravo Squad are invited as guests to the annual Thanksgiving game featuring the Cowboys. The disenchantment with the notions those of us in the safe haven of America have of war against what actually goes on in battle seems to be the juxtaposing theme Lee is shooting for here as we get only a few glimpses of the flashbacks that cause Alwyn's Lynn to more or less break down in the middle of this celebration. In short, given the inherently deep and somewhat controversial subject matter I'm eager to see what conclusions and ideas Lee has drawn with his film. The movie will also be notable for having been shot at 120 frames per second in 4K native 3D and the clarity of such images produced in this format is certainly visible in this first look. Billy Lynn's Long Halftime Walk also stars Garrett Hedlund, Kristen Stewart, Vin Diesel, Steve Martin, Chris Tucker, Tim Blake Nelson, and opens on November 11th, 2016. 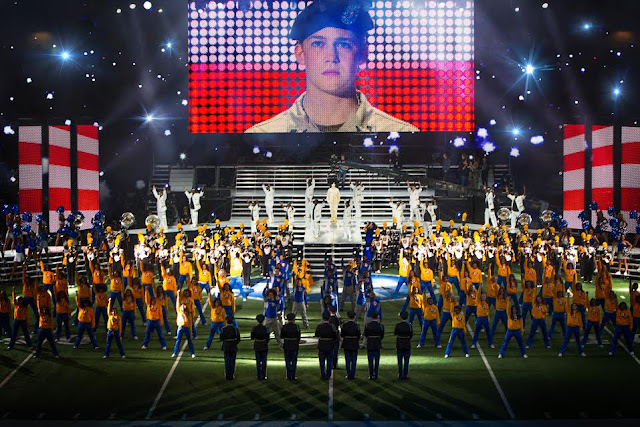 Synopsis: Three-time Academy Award® winner Ang Lee brings his extraordinary vision to Billy Lynn’s Long Halftime Walk, based on the widely-acclaimed, bestselling novel. The film is told from the point of view of 19-year-old private Billy Lynn (newcomer Joe Alwyn) who, along with his fellow soldiers in Bravo Squad, becomes a hero after a harrowing Iraq battle and is brought home temporarily for a victory tour. Through flashbacks, culminating at the spectacular halftime show of the Thanksgiving Day football game, the film reveals what really happened to the squad – contrasting the realities of the war with America’s perceptions. The film also stars Kristen Stewart, Chris Tucker, Garrett Hedlund, with Vin Diesel, and Steve Martin. Lee used new technology, shooting at an ultra-high frame rate for the first time in film history, to create an immersive digital experience helping him dramatize war in a way never seen before.